NFS (Network File System) is a distributed file system protocol that allows sharing directories and files with others over a shared network. Using it allows access to files on remote hosts as if they were local files. Setting up a NFS mount on Ubuntu or Linux Mint can be quite a tedious task. Enter Simple NFS GUI. 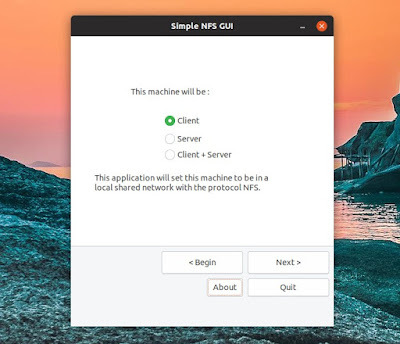 This is a GUI tool to easily set up a machine as a NFS server or client that should work on Ubuntu, Linux Mint and Debian. Simple NFS GUI takes care of the whole NFS share configuration process. When setting up a NFS server, the tool automatically sets up the /etc/exports configuration, and secures the server via /etc/hosts.deny and /etc/hosts.allow. For setting up a NFS client, the application automatically creates a directory for the mount point, as well as add the NFS mount to the /etc/fstab file with the users option, so it can be mounted by non-root users. The application also installs the required NFS packages for both server and client. I should note that while Simple NFS GUI automatically adds the network file system mount in /etc/fstab, it sets it so the NFS is not mounted until it's accessed. You can change the NFS line created by Simple NFS GUI from /etc/fstab and replace noauto with auto to automatically mount it at boot time, but this may cause the boot process to stall. 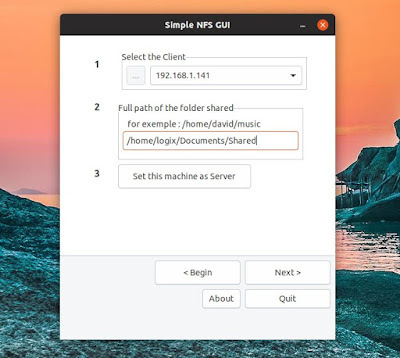 If you need to create multiple NFS shares, run the Simple NFS GUI setup process multiple times, specifying a different NFS share folder each time. 1. Simple NFS GUI requires Gambas 3 - adding a PPA on Ubuntu and Linux Mint is required. Visit this page, scroll down to the bottom and click the blue Download Now button. Next, install the downloaded DEB package. In Ubuntu, the Gambas 3 dependencies will be automatically pulled from the Gambas 3 PPA which should be added on your system as explained above. Don't run Simple NFS GUI from your applications menu as it won't work. That's because the application needs to be started as root, and its application menu entry runs it without admin privileges. 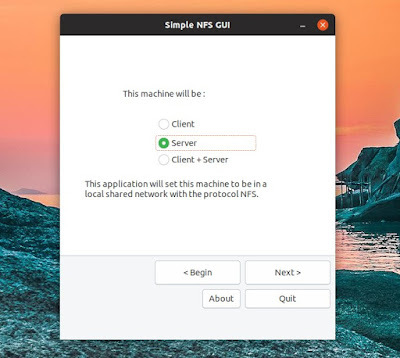 Now you can use Simple NFS GUI to set up a machine as a NFS client or server. It may take a while until the IP list is populated, because a package may be need to be installed on your system to detect the IPs, and the IP detection may take a bit to run as well. After the server list is populated, select the NFS share server IP from the dropdown. You'll also need to enter the full path of the server's shared NFS folder, and enter a name for this folder (the name needs to only contain letters). Once you're done, click the Set this machine as a Client button. Simple NFS GUI will ask you to recheck the data - if everything is ok, press Yes and the setup process is completed. You'll now need to reboot your system. The NFS share should show up in your file manager, but it won't be mounted by default. Click it and it will be mounted as long as the remote NFS share server can be accessed. On the second screen, click the ... button under Select the client to select the NFS client IP address. Like I mentioned in the client section above as well, it may take a while until the IP list is populated, because a package may be need to be installed on your system to detect the IPs, and the IP detection may take a bit to run as well. Next, click the Set this machine as Server button. 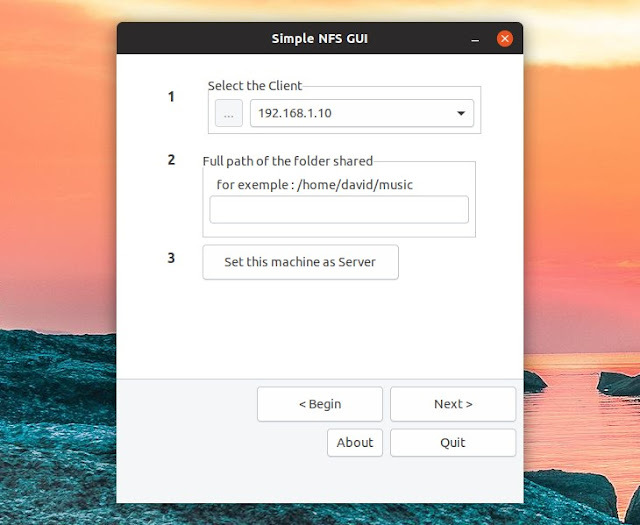 Simple NFS GUI will ask you to recheck the client IP and the server's folder path. If everything is ok, click Yes. There's only one step left: reboot your computer.